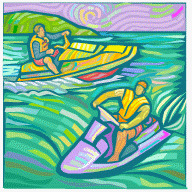 "Colonial Beach Waterfest" is a name for the jetski competition that will be making a stop in our town on August 7 & 8, 2010. The APBA is the organizer of this event, which is Round 9 and 10 of an 11-round series. It's been a few years since we have seen personal watercraft races here of any kind, so it's highly anticipated, especially a larger National series like this one. There's a pre-race kick-off party Friday on Town Hill starting at 5pm with live music by Old School. Racing begins on Saturday. That night there's a racer's party at High Tides' "Black Pearl" Tiki Bar with live music by tribute band Think Pink Floyd. Racing continues on Sunday! For the full jetski competition schedule and event traffic and parking information, click here. It was August 26, 2001. The jetski competition descended on Colonial Beach for a great day of personal watercraft (PWC) racing. The event, organized by Watersport Productions was sanctioned by the ISJBA (International Jet Sports Boating Association), an international jetski competition and PWC racing membership organization and sanctioning body for personal watercraft racing. 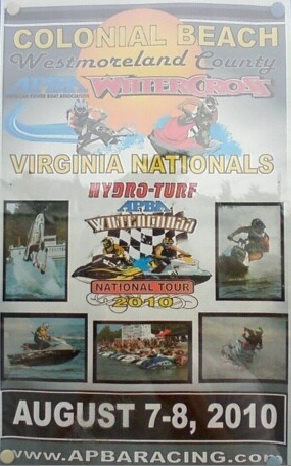 This Mid-Atlantic Watercross Tour saw a number of competitors run this Region 8 event. Novice Sport Superstock: 1-Bill Amoss, Jr.